Three Card Poker has become one of the more popular poker style games that casinos and online casinos are offering to their players. The reason for its popularity is due to the easiness of the game. The player does not play against other players but rather only against the dealer which adds more excitement as other players are all rooting for each other to win. The game requires one deck of fifty two cards dealt by the dealer from his/her left side to right. The game is really two games in one, where the player is out to beat the dealer and/or is trying to make a pair or higher in their hand (pair plus). Most casinos will only allow you to bet on a pair plus when you have wagered an ante bet to start the game. There are three circles on the semi arced table for betting. The first one on the top is called the Pair Plus bet. That is a bet a player will make if they think their hand will be a pair or higher. It does not matter what the dealer has or even if he beats you all you are betting on is that you will have a pair or higher. This bet has to be put down before the dealer deals.The second circle in the middle is the called the ante bet. This is for a player who wishes to play and will have to put the minimum bet of the table down on the circle. This also has to be put down before the dealer deals. Last is the play bet. 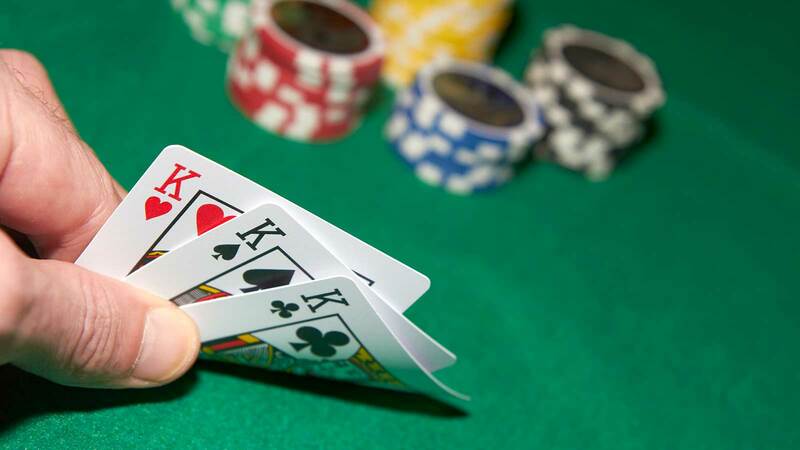 This bet is used for players who wish to challenge the dealer after seeing their three cards. The bet is usually 1-1 of the ante bet. This bet is put down after the player reviews their cards. After placing your bets on the ante circle, the dealer will deal three cards to each player and then to him/herself. The player then has the option to fold or continue. If the player continues an additional bet must be placed in the play circle. The dealer will then reveal their three cards. The dealer needs to qualify with a queen in their hand. If there is no queen anyone with an ante bet wins 1-1 on their bet. If the dealers hand beats the players, the player will lose both bets. Due to only three cards being dealt there hands are a little different than five card poker. Below are the hands from lowest to highest with their payouts. High Card  Is the highest card in your hand. This pays 1-1 on your ante bet. Pair – Two of the same cards or equal rank for example two queens. This pays 1-1 on your ante bet. Flush  Three cards of the same suit. This pays 1-1 on your ante bet. Straight  Three cards in numerical order in different suits. This pays 3-1 on your ante bet. Three of a Kind  Are three cards of the same rank. This pays 4-1 on your ante bet. Straight Flush – Are three cards in numerical order and in the same suit. This pays 5-1 on your ante bet.